This is a sponsored post written by me on behalf of Harvestland® by Perdue®. All opinions are 100% mine. I’ve always believed that when you cook for your family you should use the very best ingredients available to you — and to keep the recipes you often use as simple as possible. Cooking can be therapeutic to you as the home cook, and coming together as a family to the dinner table has additional benefits for your family’s health. Simplicity is the key. And sometimes keeping it simple means finding shortcuts in the food preparation or cooking process. Finding ingredients you can trust doesn’t have to be hard, if you know where to look. Harvestland® by Perdue®, available at Walmart, has fresh and fully cooked turkey, chicken and pork products. These products come from local family-owned farms throughout the United States and are USDA process verified. You can trust Harvestland® by Perdue® to be a natural choice for your family when you’re cooking at home. It’s food that’s pure and simple, which allows your family to Eat Like Your Ancestors.™ What does that mean exactly? Check out this fun video to find out! Luckily it’s gotten easier in the modern world to cook for your family. My favorite secret weapon for a hearty, wholesome meal is my slow cooker. 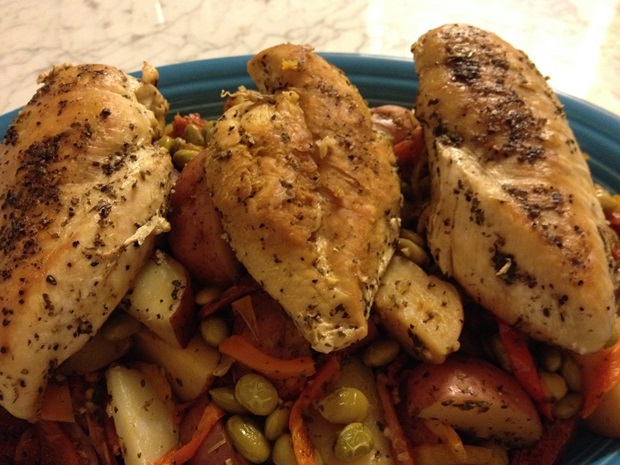 Try my Chicken Vesuvio (family-style recipe) with your family. Substitute your kin’s favorite root vegetables for a one-pot wonderful meal that will nourish the body and soul. Lightly coat a frying pan with canola oil and place on a stovetop burner, set on medium-high. Warm the pan for a minute so it is hot enough to sear the chicken breasts. Pat the chicken breasts dry with a paper towel. Using a barbecue brush, lightly coat the top of each chicken breast with canola oil. Season with a pinch each of sea salt, black pepper, and Italian seasoning. Place the chicken breasts in the hot frying pan, seasoned side down. Cook for about 6 minutes. Immediately coat the remaining side of each chicken breast with oil. Season with one pinch each of sea salt, black pepper and Italian seasoning. Cover the pan with a lid until you’re ready to turn the chicken breasts. After you turn the chicken breasts, cook for another 6 minutes or until both sides are browned. Place the potatoes, edamame, peppers, sun-dried tomatoes, onion, garlic and remaining sea salt, black pepper and Italian seasoning in a 6-quart slow cooker. Add chicken broth and white wine. Gently stir to immerse vegetables evenly in the broth mixture. This helps the vegetables to properly steam and cook evenly. Top the vegetables with the chicken breasts. Cover the slow cooker and cook on HIGH for 3 to 3.5 hours (or LOW for 6 to 7 hours) until chicken breasts and potatoes are tender. Transfer the chicken and vegetables to a serving plate. Top with juices from the slow cooker. Garnish with fresh parsley and serve immediately. Cook Time: 3 hours, 12 minutes. Yield: 6 servings. 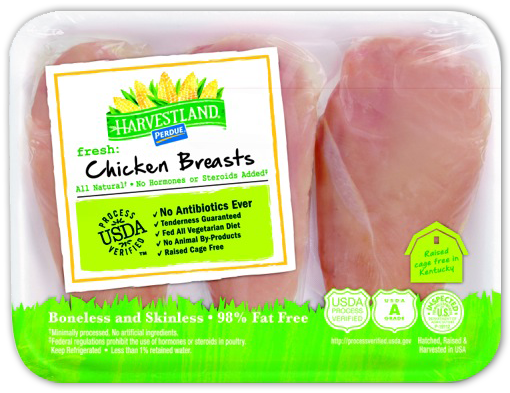 Save $1.00 off Harvestland Fresh or Frozen Chicken.